With its never-ending beaches, exotic animals, thriving new surf scene and luxury villas why isn’t Sri Lanka your top holiday destination for 2019? (actually, it is, according to Lonely Planet). We’ve put together the guide to some of the most instagrammable luxury villas in Sri Lanka for your travel inspiration. Located on the Southern tip of the island, lies the sumptuous ISHQ Villa, one of the top instagrammable luxury villas in Sri Lanka. The one-story dutch inspired luxury villa comes with four bedrooms, all with adjoining patio gardens and opulent king size beds. Rooms are decorated with contemporary art and plush furnishings line the interior. Besides, every room features a private outdoor tropical rain shower. ISHQ Villa sits amongst the perfect beachfront settings, only a few steps away from the glistening Laccadive Sea. If the ocean isn’t enough to entice you, grab a cocktail (prepared by in-villa professionals) and relax in the exotic garden with its well-manicured lawns, sofas, and seating area. If you’re looking for an idyllic spot to stay in Sri Lanka, the Halala Kanda Villa could be the right luxury pick for you. Halala Kanda, also known as firefly hill, has a romantic history. It was built in 1912 by Simonmeru Gunathilaka, with the purpose to win the heart of his young bride. After years of abandonment, the plantation was reawakened in 2010: its new owners selected local artisans to breathe life back into the estate and return it to its former brilliance, whilst adding their own eclectic features. Located in the hills of Weligama, Halala Kanda is a tranquil sanctuary in which to escape and unwind from everyday life. On arrival, guests make their way through the grand porchway, into the palatial corridor lounge, with its lofty 20m high vault ceilings and assortment on Sri Lankan antiquities. Off of the lounge, is the bewitching room of curiosities, with its eclectic furniture and trinkets. Halala Kanda sits amongst two acres of picturesque gardens lined with coconut palms, cashew orchards, pineapple groves, and even a vegetable patch. If plants and vegetables don’t excite you, why not take a dip in the pristine saltwater pool or dream away the days on one of the many verandas and balconies. Sea Heart house is a little different from the other instagrammable luxury villas in Sri Lanka, as it prides itself on being Eco-friendly. Whilst being perched on a cliff top high above the beautiful natural lake, with every room offering unrivaled views of the beautiful surroundings, it also offers water harvesting and uses solar panels to heat water and contribute to electricity production. Who said ECO can’t be luxurious? This opulent eco estate boasts an expansive infinity pool, a state of the art fitness center and a tropical garden. This property is not only packed with intricate details, but the building itself is special. Designed by an award-winning architect this estate maximizes its potential space and blurs the boundary between the end of the property and beginning of the lake and natural surroundings. No detail has been missed, the garden intricately sculpted by a local garden architect to allow fluidity between the house and nature. 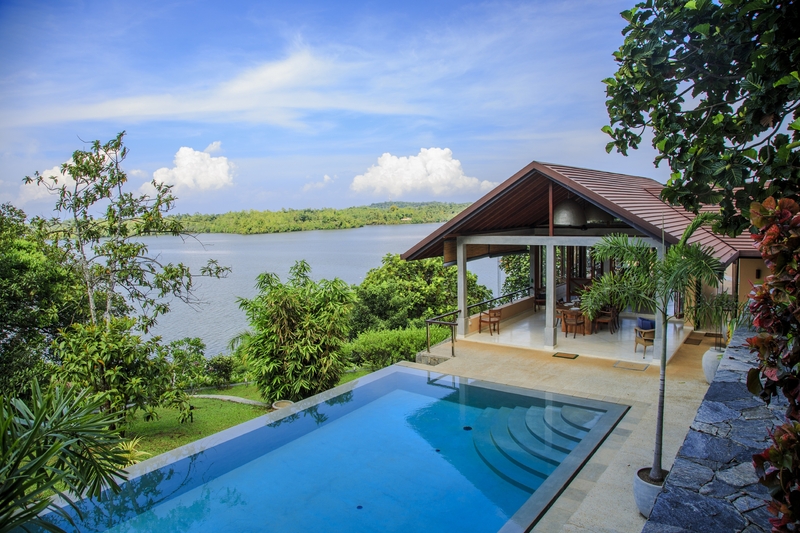 Perched in an ultra secluded location, overlooking the pristine waters of the Indian Ocean, is the magnificent Ani Villa Monara. The exuberant 7-bedroom villa is designed with a modern, sleek interior, making this one of the most instagrammable and most luxurious villas in Sri Lanka. Private swimming pools, plush living spaces, along with state-of-the-art amenities, all with a five-star staffing team awaits in this dreamy exclusive space. Lavish bedrooms and infinity pool, both with unobstructed views of the ocean, will be your sanctuary from the outside world. Grab a cocktail and your loved ones and relax through the day in utter seclusion. If sitting still seems like is a potential nightmare, this designer Villa couldn’t have more to offer. With kids water slides, fitness center, yoga temple, and onsite tennis courts, there are so many things to keep you busy. Sit down and relax after all that excitement in the tv and games room or lose yourself in the magic of the many books of the secluded library. If seclusion and nature are what your holiday dreams are made of, Villa Maya retreat is likely to leave you breathless. As one of the most instagrammable luxury villas in Sri Lanka, it offers full exclusivity and is the perfect place to bring your loved ones to disconnect, rewind, and rejuvenate. This sublime property features panoramic views of luscious green rice paddies, and innovative indoor-outdoor living setups, perfect for those who value the great outdoors while maintaining the highest level of comfort. 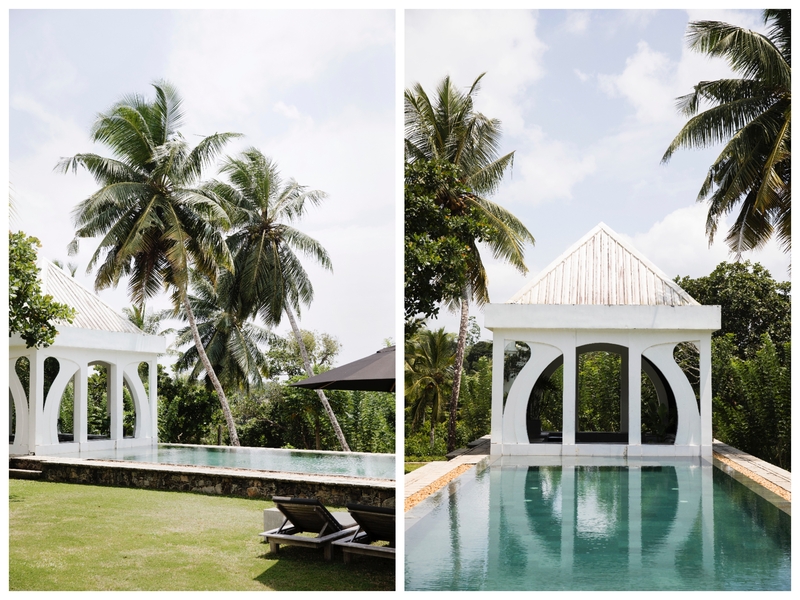 Housing 5 bedrooms, the villa can hold a maximum of ten occupants and is perfect for hosting destination weddings and events, such as yoga and romantic retreats. Besides, Villa Maya has its own team of staff to attend to your every want and need from cooking to cleaning, as well as arranging trips. Natural living has never been so glamorous. Tucked away on the glimmering edge of the southern province is Villa Ranawara, one of the most gigantic instagrammable luxury villas in Sri Lanka. Set on a grand 23-acre estate, this luxurious villa has every luxury comfort its guests could dream of. South Facing over two levels, this spectacular oceanfront property offers 5 bedrooms, all with breathtaking 360-degree views of the ocean and surrounding gardens. No surprise, Villa Ranawara also has a team of staff at your beck and calls to ensure a carefree trip. With an extensive library, open-air terraces, tropical garden and beyond, Villa Ranawara skillfully creates a relaxed atmosphere finished off with simple, but stylish accents. Offering bespoke services, personal chef, games room, home theatre room, and an endless array of luxury amenities, this designer villa really does have it all. Villa Talalla’s main byword is contemporary. Once inside this designer villa, you can shut off from the rest of the world or indulge in the group atmosphere. With private balconies, bathtubs, as well as the exquisite master bedroom featuring private terrace you can be left alone to indulge in your own holiday reveries. Alternatively, use the wide open spaces for communal dining and group activities, such as relaxing in the extensive pool or mastering yoga in the open air yoga. All the rooms offer sumptuous decor and are equipped with both air conditioning and ceiling fans, ultra luxurious bedding, as well as deluxe coffee and tea making facilities. The resort’s grounds are nothing less than breathtaking and are guaranteed to enhance what is already a spectacular stay. The ground floor offers the pool as well as the garden rooms, ideal for those looking for an exclusive area away from the main house. And addition, Talalla has a rooftop garden and a quaint bar. Lounge chairs adorn the space offering the perfect place for evening cocktails and watching the sunset (or sunrise if you’re an early bird). Last, but not least in our list of the most instagrammable luxury villas in Sri Lanka, Sielen Diva consists of seven blissful rooms with a maximum capacity of 14 guests. Each decadent room is of varying sizes, making it perfect for group or family stays, and is furnished in the contemporary style with hand-picked artwork featuring throughout. Food is a key aspect of your stay at Sielen Diva, with customizable menu options, and choice guest preferences the chefs at Sielen Diva aim to please. With a diverse variety of freshly caught fish and seafood, local buffalo milk, as well as homegrown herbs, you won’t get bored with the available options. This expansive property not only provides sumptuous food, ornate architecture and incredible staff, but it also has activities and games aplenty. With a designated games room equipped with foosball and pool table, darts board, poker set, and tv entertainment options, it’s not difficult to find some time to sit back and relax.